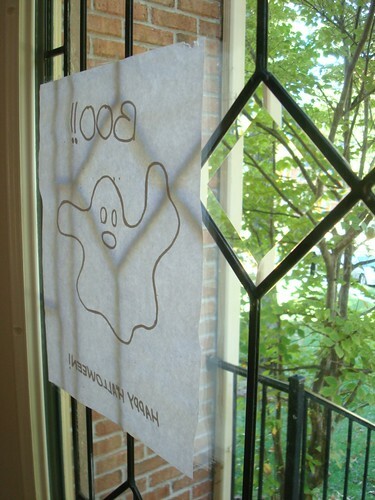 As I mentioned in this post we got Boo!ed by our neighbors. Apparently it's an idea that has gone mainstream because during the course of the week I found this blogpost with instructions. Even Target is in on the action. Regardless, I was excited to be part of something that builds neighborhood camaraderie so we headed out to Target last night to look for some little somethings to give our unsuspecting victims. 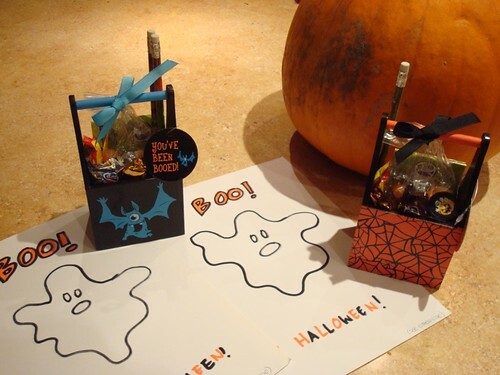 Which is when I discovered that Target actually has little boxes meant for Boo!ing, filled with orange and black jelly beans. The tag even describes what it is. 0_o But they were cute and the price was right, so we bought a couple, along with a pack of stickers and a bag of Halloween candy for our (hopefully existent) trick or treaters. 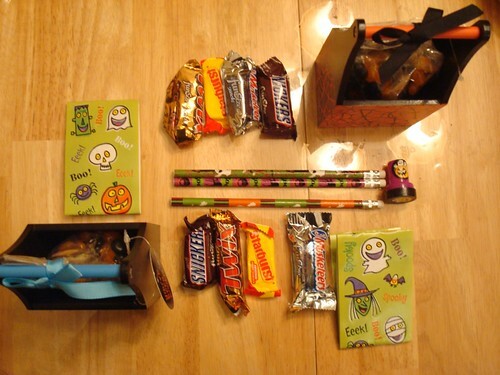 The pencils and stamp were repurposed from our own Boo! package. Then I printed out the instructions and drew a happy little ghost on the back of each. 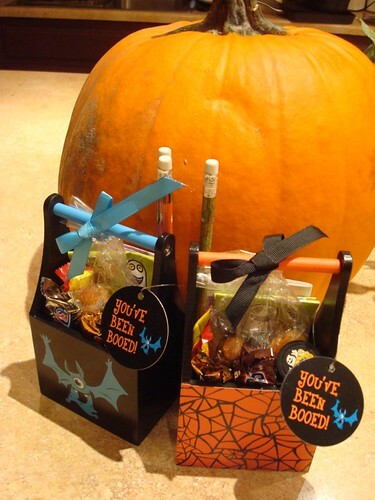 And so, at 11:00pm last night, my husband and I went sneaking out into the neighborhood to spread the Boo!ing. Hopefully our recipients will be a bit more on the ball than we were in turning it around as Halloween is just one week away! What an adorable idea! I wish our neighborhood was friendly. We've been here a little over two years now and I only really know our next door neighbors. Maybe I should start "booing" people!